Hotel Chandralok is a budget deluxe hotel located in Srikot, away from the hustle and bustle of Srinagar. 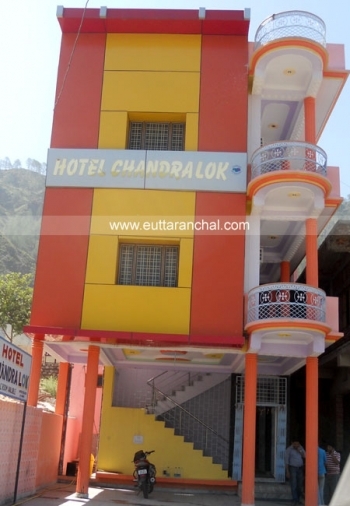 Chandralok is a newly built hotel with all the modern facility to provide you a comfortable stay. Chandralok hotel is located on the main Rishikesh-Badrinath Highway in Srikot, just 2 kms from Srinagar (Garhwal). The hotel is on the main road itself, thus can be reached easily. There are total 14 rooms in Chandralok hotel and categorized as AC Deluxe Rooms, Deluxe Rooms, Semi Deluxe rooms and dormitory. Deluxe rooms have coolers and semi deluxe rooms have ceiling fans. Hotel Chandralok have a multi cuisine restuarant. Only vegeterian meals and snacks are served in the restaurant.